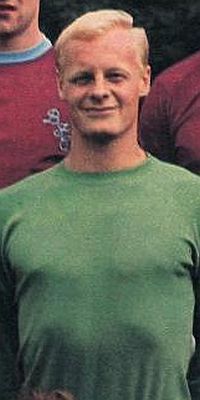 When Peter Mellor joined Burnley from non-league football at the end of the 1968/69 season it was the start of a professional football career that has run for over forty years as a player and coach. The Prestbury born Mellor was rejected by Manchester United as a schoolboy and instead joined Manchester City as an apprentice. A blossoming career looked on the horizon when he was called up, and played, for the England youth team but it proved to be a false dawn and he was released by City at the end of his apprenticeship and moved to Cheshire League Witton Albion where he combined playing part time with becoming an apprentice motor mechanic. It was there that he was spotted by Burnley and he was invited for trial towards the end of the 1968/69 season and played in the reserves. He impressed manager Harry Potts enough to earn himself a deal but at that time he couldn't have known circumstances during the summer would lead to him going straight into the first team. Regular first team goalkeeper Harry Thomson was sacked and that left Mellor as the only choice to go in goal and he duly took his place in the side for the opening game of the season against newly promoted Derby County at the Baseball Ground. He kept a clean sheet in a 0-0 draw but didn't quite play the full game. Just a few minutes from the end he suffered a hand injury and was forced off. Eric Probert came on as substitute with left back Les Latcham going in goal. However, he was fit enough to retain his place for the midweek home game against Spurs when, despite the Clarets losing 4-0, he saved a Jimmy Greaves penalty. There is no doubt that he started the season well but nothing could surpass his performance against Leeds at the end of August. He virtually kept them at bay singled handed and we managed to get a point from a 1-1 draw with Brian O'Neil scoring a somewhat dubious looking goal for the Clarets. Mellor had an outstanding season and played in every single game, a total of 50 league and cup games, and many Burnley fans believed they had a future top goalkeeper in the team. Unfortunately that was where it all ended for Burnley and Mellor. Before the 1970/71 season got underway he suffered a shoulder injury that kept him out until November. Tony Waiters, brought in after previously having retired as a player, took his place in the side. When he did come back his form was not good and he was soon left out again. He won his place back soon after the start of the 1971/72 season but was still unable to recapture the form he'd shown in that first season. He was left out for a couple of games with Jeff Parton coming in and by January 1972 manager Jimmy Adamson splashed out over £50,000 to sign Chesterfield goalkeeper Alan Stevenson. Mellor had played his last game for Burnley. As part of the Stevenson deal he joined Chesterfield on loan for a month and played four times for them. On his return he was soon sold to Fulham in a £25,000 deal. He became first choice at Fulham immediately and for over four years he was in the first team. The highlight was playing in the FA Cup Final of 1975 although the day proved not to be a good one for Mellor or Fulham. They lost 2-0 and he was at fault with both goals scored by West Ham's Alan Taylor. An injury during a 5-1 defeat at Notts County in November 1976 saw him lose his place to another goalkeeper Fulham had signed from Burnley, Gerry Peyton. Mellor didn't win his place back in the next year and it was time to move on again, this time signing for Hereford United. His stay was under a year when he moved again to his last English club, signing for Portsmouth in the summer of 1978. He spent four years at Fratton Park, taking his total number of Football League appearances to 424. During his time with Pompey they were promoted from the Fourth Division but in 1982 with Alan Knight pushing for a regular place in the side he decided to retire. He moved to North America where he signed for Edmonton Drillers before finally hanging up his boots. However, so impressed was he with life and 'soccer' on the other side of the pond that he decided to stay there. Since retiring as a player he's been heavily involved in coaching and for a time a full time national goalkeeping coach involved with all the national teams. He is a fully qualified coach with both English and US licences as well as the CONCACAF goalkeeping diploma. When MLS got underway in 1996 he became goalkeeper coach of Tampa Bay Mutiny and then moved on to Real Salt Lake. He then became director of coaching for the Florida Premier Soccer Club and is now goalkeeper coach with the Island Coast Soccer Alliance. There's no doubt that Peter Mellor has gone on to have a long and distinguished career in the game that many predicted during that first 1969/70 season when he was also the subject of a film at the time that was released back in 2003 under the title of 'Team of the Seventies'. But for Burnley fans he'll always be remembered as a one season wonder with him never seeming to recover his form following the shoulder injury.